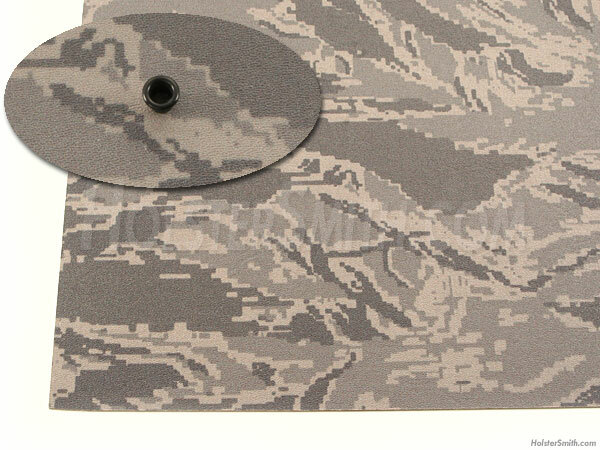 This product is cell/smooth textured .080 gauge Tiger Stripe Digital Camo KYDEX®. This pattern is an exclusive product and is specifically created for thermoform molding. Tiger Stripe Digital camo is made from KYDEX® cell/smooth textured sheeting and features the design on the cell-side surface. The pattern is not a film on the surface of the material, but is made from a proprietary process, exclusively developed by our design team. Our specially produced pattern does not fade or crack when formed and is highly durable under normal use. The base finish of Tiger Stripe Digital Camo KYDEX® sheet is semi-gloss and can be bead-blasted, if matte finish is desired. The camo design allows total pattern control over the entire sheath/holster surface. This is an important requirement for professional sheath and holster designers.